The publishing company I had been employed by for 26 years closed. After two years of unemployment during the market crash of 2009, and unable to find new employment, I had to reinvent myself. After all, a 50-year old, Caucasian woman who does not speak a second language was deemed unemployable by many industries who sought younger, multi-lingual, culturally diverse candidates. Thus, Weenie Lynn's was born! 2018 marked our 8th season in business as special events (festivals, art shows, concerts, sporting events, etc. 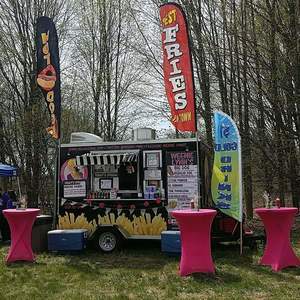 ), corporate events, and private party food "truck" out of Danbury CT. For four years we were an NY-style hot dog cart, before upgrading to a full-service food trailer offering a varying menu that accommodates carnivores and vegetarians alike while maintaining a budget-conscious price point! While we are a "hot dog truck," our menu is varied and appeals to the entire family. 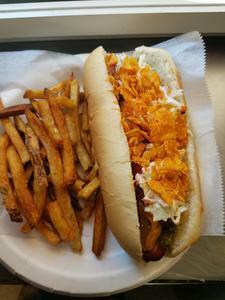 We offer over 20 toppings for our hot dogs including crushed Doritos, spicy sauerkraut and a plethora of hot sauces and other condiments such as Chipotle mayo, Kim Chi, and BBQ sauce. No need to stand in one line for children and another for parents. Our top-selling item is our fresh-cut, never-frozen, twice-fried French fries. They can be served plain, or topped with warm cheddar cheese sauce, chili and cheese sauce, bbq pulled pork & 'slaw, or served as a Special, TURKEY TACO FRIES topped with sour cream, fresh tomatoes-cilantro-red onion-jalapenos. Our top-selling sandwich item is a toss-up between The Porker (slow-cooked bbq pulled pork with a kick grilled American cheese sandwich on multi-grain whole wheat bread, and served with French fries) and El Cubano (seasoned, slow-cooked, juicy pulled pork served on a Club roll with crunchy pickles, grill-warmed baked ham topped with melting Swiss cheese and a swirl of yellow mustard). Both sandwiches are delicious and vie for our #1 spot as customer favorite! Weenie Lynn's is family owned and operated and is, in general, a part-time business (operating April through November each weekend and maybe 1 day a week for corporate events). Michael & Lynn Negron own and operate the business with the help of their five (5) children, all of whom have worked or continue to work in the food truck since its inception and all of whom had job-specific functions at each event. Running a family-owned business has been an education in itself for all members but especially for the children who engaged in customer service, who learned how to manage inventory, how to determine break-evens and compute profit and loss margins for each event we do, as well as how to establish pricing for private events and how to handle situations under pressure. Our children are currently 19, 22, 24, 25, and 28, and we have been running Weenie Lynn's for 8 years! Visit Weenie Lynn's online here. Weenie Lynn's tags Lisamarie Ault, chef at Paradise Foods.